Metropolitan Joseph - The priest as administrator: Let all things be done decently and in order. St. Paul to the Corinthians (1 Cor. 14:40) and The priest as a husband and a father to his family. Bishop Basil - The High Calling of the Priesthood. Bishop Anthony (for Bishop Alexander) - The Integrity of the Priesthood. Bishop Thomas - What It Means to Call the Priest Father. Bishop Anthony - Priesthood and the The Meaning of the Apostolic Succession. Bishop Nicholas - The Priest as the Servant of Christ and His Church. Bishop John - The Priest As Minister of the Sacraments, the Holy Mysteries. The Priest as the Servant of Christ and His Church. The Priest As Minister of the Sacraments, the Holy Mysteries. We apologize for the poor quality of the video recording. Our cameras were not set up in time following the Matins service. We do thank Dn. Christian for recording with his phone as well as Bishop John for recording the talk on his computer after he got home. Priesthood and the Meaning of the Apostolic Succession. What It Means to Call the Priest Father. 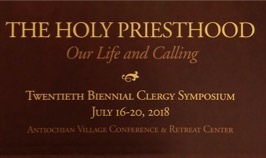 The High Calling of the Priesthood. The priest as a husband and a father to his family.